Christmas came a bit early for all of y’all! This week my Roll Stitch Afghan CAL was released on the Annie’s Creative Studio website! How cool is that? Introducing the Roll Stitch Afghan Crochetalong! The roll stitch, also known as the bullion or rice stitch, features a beautiful texture that is oh-so touchable. 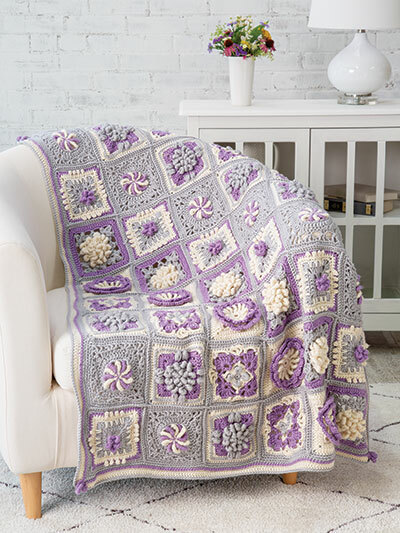 This gorgeous afghan, designed by Rohn Strong with motif designs by Bonnie Bloom Pierce, features six different motifs with variations of the roll stitch. The beautiful yarn used in the Roll Stitch Afghan Crochetalong is courtesy of Premier Yarns. Each episode will cover one of the motifs, which are worked from the center out. They feature three different colors of Premier Yarns Everyday Soft Worsted. After all 48 motifs are complete, they are then joined and the border is worked in the round, with a few more roll stitches for good measure! You can sign up for Annie’s Creative Studio for FREE today and get started right away! The first two episodes are now available on the website! How cool is that? Photo shoot Day and Pattern Sneak Peek!